Does it matter what kind of gas was used in the latest Syria attack? What kind of gas was used in the latest attack in Syria? It appears that dozens of Syrian civilians were killed on Saturday in an attack using chemical weapons. Initial reports from the humanitarian group known as the White Helmets and Syrian American Medical Society indicated that chlorine gas might have been the agent used. The attack occurred in the city of Douma, which had been a rebel stronghold in the suburbs of Damascus, Syria's capital. In a series of Sunday morning tweets, President Trump indicated that the Syrian government of Bashar al-Assad, as well as its Russian and Iranian allies, was responsible for the attack, and that they would pay a "big price" for using chemical munitions. "Many dead, including women and children, in mindless CHEMICAL attack in Syria," Mr. Trump tweeted. "Area of atrocity is in lockdown and encircled by Syrian Army, making it completely inaccessible to outside world. President Putin, Russia and Iran are responsible for backing Animal Assad. Big price to pay. Open area immediately for medical help and verification. Another humanitarian disaster for no reason whatsoever. SICK!" The U.S. government is still trying to verify what happened. And one thing it's trying to figure out is whether the chemical used in the attack was chlorine or a nerve agent. Last April, after the Syrian government used sarin, a prohibited nerve agent, in an attack on another rebel-held town, Mr. Trump ordered a retaliatory strike against a Syrian air base. Why does it matter if it's a nerve agent or chlorine? Observers believe that chorine has been used numerous times by the Syrian government as it fights rebel forces throughout the country, including since the 2017 retaliation ordered by Mr. Trump. While it is generally accepted that the use of any chemical agent in wartime is illegal under international law, chlorine can have peaceful uses, and is not regulated and monitored in the same way sarin is. Still, the attack over the weekend was especially brutal, regardless of what sort of chemcial agent was used. Sarin, which was originally developed by Nazi Germany, was banned under international law in 1997. In 2013, the Assad regime used the chemical to kill some 1,400 civilians, including 426 children, outside Damascus. The Obama administration, having said that the use of the chemical weapons was a "red line" the regime could not cross, considered a military response at the time. Ultimately, however, the Syrian government agreed to destroy its stockpiles of the weapon, and the U.S. did not respond with strikes. Under the terms of that agreement, which was brokered with Russia, the Organization for the Prohibition of Chemical Weapons (OPCW) was responsible for overseeing the destruction of Syria's stockpile of chemical weapons and weapons-making material. Syria began handing over its weapons stockpile in late 2013 and early 2014 for destruction. In January 2016, the firm contracted by OPCW to destroy the last of the chemical weapons said it had completed its work and destroyed Assad's "declared" stockpile. 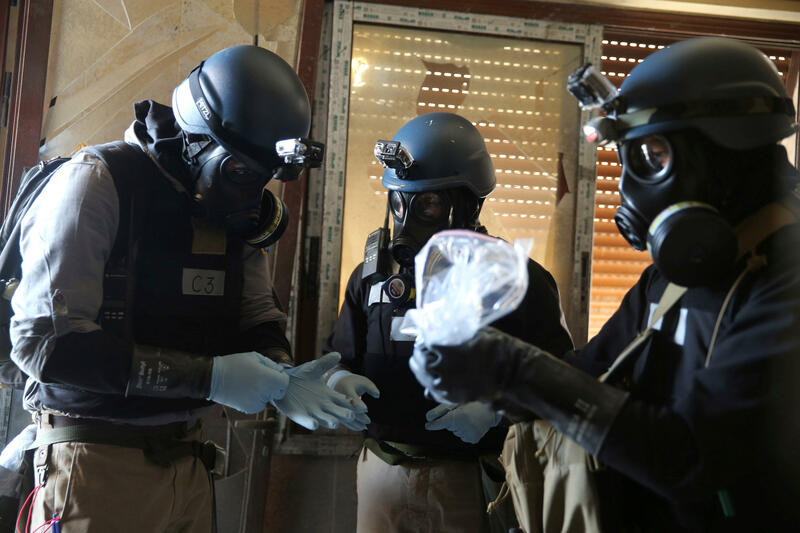 The vast majority of Syria's nerve agents and banned weapons were widely considered to have been surrendered and destroyed. Later in 2016, however, reports began to emerge that the regime was deploying chlorine gas, which is not a banned substance, in barrel bombs that it dropped on civilians. An August 2016 report from the OPCW determined at least three instances in which government forces dropped chlorine-filled barrel bombs. Russia blocked U.S.-led efforts in the U.N. to sanction the regime in response. And in 2017, the Syrian government used sarin once again, this time against civilians in the town of Khan Sheikhoun. Dozens of people were seen on video gasping for breath and foaming at the mouth with no apparent outside wounds, distinct signs of the use of a nerve agent. More than 80 people died, and images of suffocated children ricocheted across the world. In response, the Trump administration ordered the the launch of a barrage of Tomahawk cruise missiles against a Syrian airbase, marking the first time the U.S. had directly targeted the Syrian regime since the start of the country's civil war in 2011. Will the U.S. respond if chlorine was used in the attack, and not a nerve agent? The Trump administration's policy is that the use of either kind of gas is illegal and would warrant a military response. But if the U.S. finds that a nerve agent such as sarin was used instead of chlorine, or if nerve agents were mixed in with chlorine, retaliatory attacks against Assad regime targets may be bigger and more severe. One month ago, after reports of gas attacks against rebels, Secretary of Defense James Mattis said "it would be very unwise for them to use weaponized gas. And I think President Trump made that very clear early in his administration." On Monday, following the Douma attack, Mr. Trump said that the administration would be making a "major" decision on Syria within the next 24 to 48 hours. "This is about humanity, we're talking about humanity, and it can't be allowed to happen," Mr. Trump said while talking to reporters at the White House. "We'll be making that decision very quickly, probably by the end of today. We cannot allow atrocities like that." Syria is a signatory to the Chemical Weapons Convention, which prohibits chlorine from being used as a weapon. Administration lawyers also argue that the use of chlorine violates the spirit of the 2013 agreement in which Syria said it would surrender its chemical weapons stockpiles. However, it is still unclear whether Mr. Trump will order a military response to the Douma attack. CBS News' Margaret Brennan and Stefan Becket contributed to this story.